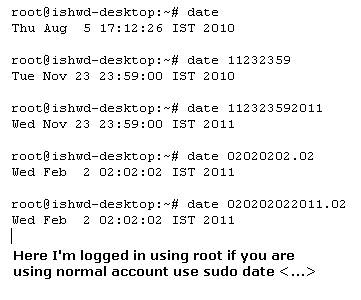 The basic way to alter the system’s date in Unix/Linux through the command line environment is by using “date” command. Using date command with no options just displays the current date and time. By using the date command with the additional options, you can set date and time. "man date" and "date --help"
and minute for the time that you wish to set. You can also provide an optional two four or digit year and number of seconds. # 23rd of November at 11:59pm. # As above, but also sets the year to 2011. # 2nd of February at 02:02:02 am. No change in year. # As above, 2nd of February, at 02:02:02 am but also sets the year to 2011. 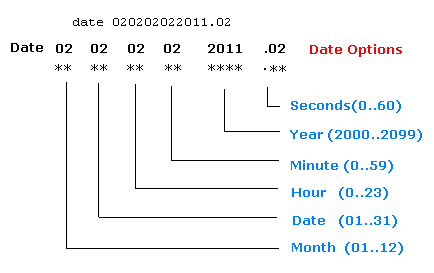 # Note here that the .02 (seconds) is preceded by a period after year 2011. You must at least provide two-digit values.